Lifelogging is the activity of collecting records of one’s life over an extended period. Most of them are quantified data such as weight, sleep time and expenses. Although technology isn’t a precondition for lifelogging, many opted for gadgets and smartphone apps that made tracking less intrusive and more convenient. There has never been a short of lifelogging apps and devices in the market that represents a barrier to beginners of lifelogging - isn’t it annoying to use an ads infested app, or buy an expensive gadget? In this post I am going to show you lifelogging for free in the layman’s way. I have been lifelogging since the beginning of 2018. 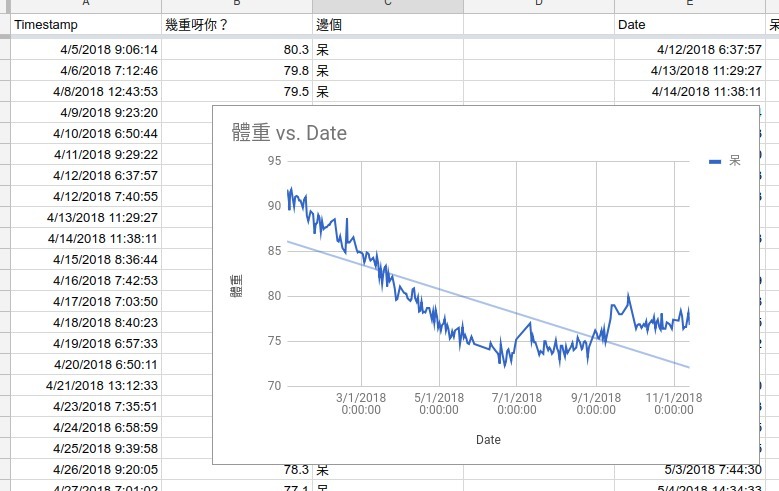 My dataset expanded from just daily measure of body weights to my sleep duration, expenses, steps walked, moods, drinks drank and more. Lifelogging may seem troublesome in a glance, with expensive gadgets and intrusive/shady mobile apps as prerequisites, but it doesn’t have to be like that. Lifelogging can be done cheap and easy. I am going to show you how to lifelog with just Google Form. First you’ll need a Google account. The thing is you have you store your data on Google, otherwise, there’s no point to continue reading. Go to Google Drive, click “Create” and select “Form”. You are creating a form. Like a web survey page, you can define questions of different kinds, some useful fields are text, date, time, number and multiple choices. I am sparing you the details of how to create a Google Form because there are much better tutorials already on the Internet, and that the point of this post is to show you how I use Google Form as a mean of lifelogging. For example, the picture below shows a form tracking what I drink. 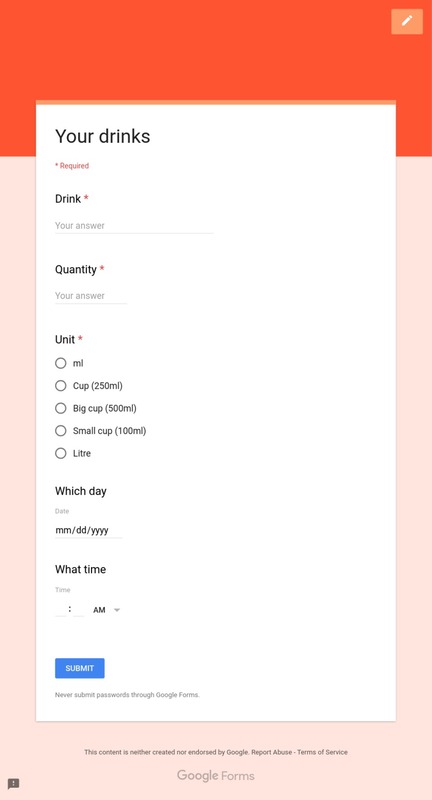 This form uses standard single-line text, radio buttons for multiple choice, datepicker and timepicker for recording time on top of the automatically appended response time (more on that later). You can then create a sheet to store all form responses. A good thing about this is, you can add many worksheets in the same workbook to generate reports based off form responses. One note: you may want to hide the rows on top regularly to avoid scrolling 1,000+ rows to the latest records every time you visit the sheet. You may say, this isn’t anything surprising because browser bookmark can well serve the same end. True. Clicking any of the rectangle basically opens the form page on a webview. However, one interesting thing you may discover if you check the HTTP request the page makes when submitting a Google Form, there is one surprising thing. In the age of single-page app, service worker and AJAX calls, Google Form still do things the old-school way. It’s how things worked 10 years ago, when I first learned HTML. As long as your page submits a POST request with form body that resembles what Google Form is submitting. In fact, in one of my work back in 2013, a graduation photo registration website for my University was made to recreate the form Google Form is using under the hood, yet it looks entirely diffent than Google Form. This presents an interesting opportunity for us because now we can make a form however we like that can look arbitrarily different from the original Google Form, leading us to the last section of this post—, your very own lifelogging app with the backend taken care of. As everything down the pipeline is handled by Google Form, and there’s nothing stopping you from doing whatever you want to the user interface before form submission. In my progressive web app shown above, I added a list of historic responses. Tapping them will automatically populate the form and then submit the form. Of course, it still requires Internet connection in order to submit the form, so it isn’t exactly optimal. Also, submitting the form inevitably redirects you to Google Form’s default response page, breaking the illusion that you host your own form instead of using Google’s. However, this behavior can be worked around by simply proxying form responses. 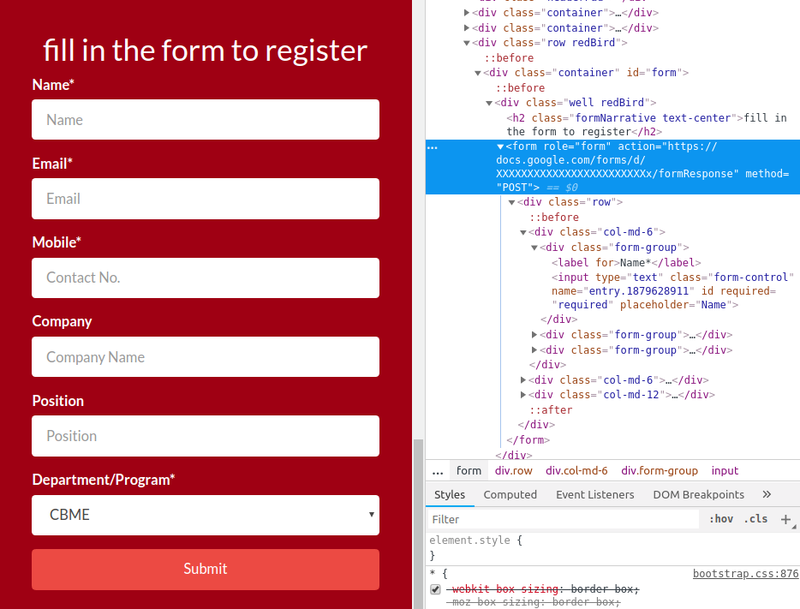 This way, you delegates the form submission to an application serving as a proxy on a web server, instead of submitting the form by yourself on a web page. With that, you can even cache your requests using service worker, or do all sorts of preprocessing before eventually submitting it to Google. I do have a Telegram bot doing that job for me, as a sort of personal bookmark. Sharing links to Telegram on the mobile is faster than opening up a form and pasting it. Plus Telegram does a good job caching the request when my phone is offline. 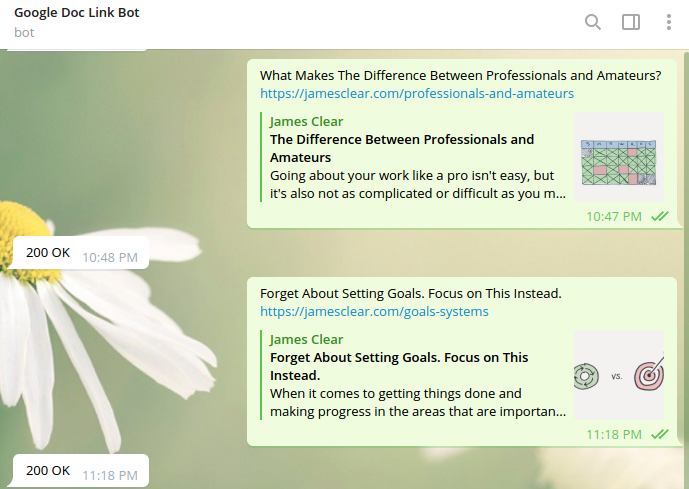 I use a Telegram bot to receive links and submit them to Google Form. It works offline. You may say, at this point things have evolved so much it has reached escape velocity from the layman planet to the domain of web developers. In fact, you are probably right. Stopping at any point of this post can still well serve you in a lifelogging perspective. At the end, we just want to log stuff, and perform post-processing. One caveat is that, it only works if Google Form continues to work this way. There is nothing we can do about it when Google decided to kill Google Form, as they did for many old Google products. Even so, it is not difficult to roll out a Google Form replacement. A alternative to downstream integration with Google Sheet could be difficult though. I wish this post gives you some useful insights into how to use Google Form for your lifelogging purpose. Note that I don’t mean Google Form is the only way of lifelogging. Bullet journal, mobile apps, fitness trackers all serve their own niches, yet if you don’t feel like investing heavily into lifeloggin, Google Form can be an easily accesible alternative.